ACES students give a fresh coat of paint to the bridge at Prairie Ridge recently. The students spent the day weeding, painting and providing other services to spruce up the park. 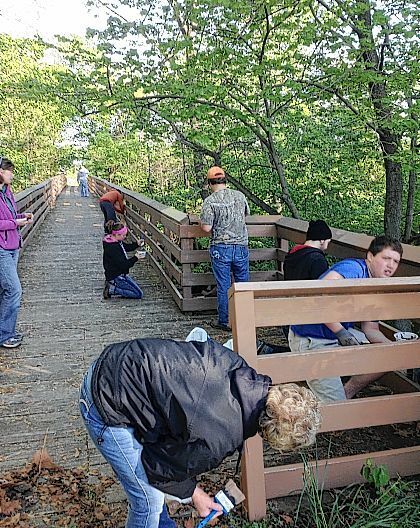 GREENVILLE — Prairie Ridge is looking better thanks to the recent partnership with the Achievement Center for Educational Success (ACES) students and Darke County Parks. The students and their teachers met Laura Schwieterman, volunteer coordinator of the Darke County Parks, at Prairie Ridge and spent several hours completing much needed work there. The students removed weeds from the Bower, which was built last summer by park volunteers and is a representation of where the Native Americans met during the warm months, instead of inside the council house, for their meetings and ceremonies. Students also gave the landscape around the front entrance of the council house some attention. They completed their day by giving the bridge a new coat of paint for the summer. ACES is a program run by the Council on Rural Services which offers an alternative education program for students 9-12. Through this program they incorporate several activities and services that promote personal development along with life skills. Those with a group or organization who would like to volunteer with the parks should call 937-548-0165 and ask to speak with Laura.